Get outdoors at Safaris and Pyhatunturi. Explore the numerous day-trip ideas around Rovaniemi: Korouoma Canyon (in Posio), Pyha-Luosto National Park (in Pyhatunturi) and Kopara Reindeer Park (in Luosto). There's lots more to do: Head underground at Syvasenvaara Fell, hit the slopes at Ounasvaaran Hiihtokeskus Oy, admire the sheer force of Auttikongas, and get engrossed in the history at Arktikum. To find more things to do, reviews, maps, and more tourist information, use the Rovaniemi trip itinerary builder tool . Barcelona, Spain to Rovaniemi is an approximately 9.5-hour flight. You can also do a combination of flight, taxi, and bus; or drive. The time zone changes from Central European Time (CET) to Eastern European Time (EET), which is usually a 1 hour difference. In May, Rovaniemi is colder than Barcelona - with highs of 12°C and lows of 3°C. Finish up your sightseeing early on the 4th (Sat) so you can travel to Helsinki. Visit Sea Fortress Suomenlinna and The Esplanadi Park for their historical value. Get some cultural insight at Rock Church and Helsinki Cathedral. 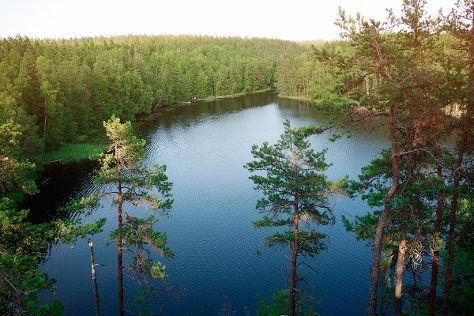 Explore Helsinki's surroundings by going to Nuuksio National Park (in Espoo), Sipoonkorven Kansallispuisto (in Vantaa) and Teijo national park (in Pernio). Next up on the itinerary: take a stroll through Katajanokka, contemplate in the serene atmosphere at Kamppi Chapel of Silence, and hike along Pornaistenniemi Nature Trail. To find maps, ratings, more things to do, and more tourist information, read Helsinki trip itinerary builder . You can fly from Rovaniemi to Helsinki in 4 hours. Other options are to do a combination of train and flight; or drive. Traveling from Rovaniemi in May, things will get a bit warmer in Helsinki: highs are around 18°C and lows about 7°C. Finish up your sightseeing early on the 9th (Thu) so you can travel back home.